Pinterest’s 2018 Wedding Report predicted the rise of midnight snacks, edible flowers and metallic cakes across the country. Closer to home, we spoke with local caterers to find out what’s new and next when it comes to marital meals in the metro. Taste! 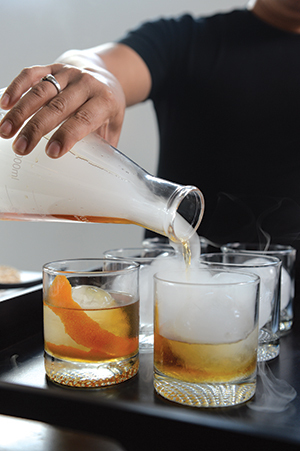 To Go offers a photo-perfect Smoking Gun Whiskey Bar at weddings it caters. Whiskey with cherrywood smoke, bitters and maple syrup is poured over an ice ball. No matter what’s on the wedding-day menu, “presentation has become more important than ever with our social media-centric society,” says Alex Jimenez, director of catering and events at Two Rivers Hospitality Group. Emily Gross, owner and managing partner of of Taste! To Go, agrees. “We’re repeatedly challenged to offer a hands-on element for the guests so they can put their own signature on the menu” to provide an unexpected, #PicturePerfect addition to the reception, she says. Some of her most wow-worthy projects have included the molecular gastronomy technique of “spherification” (using chemicals to shape liquid into edible spheres), performance bartenders, oversized helium balloons with floating trays, and on-site chefs hand-pulling fresh mozzarella. 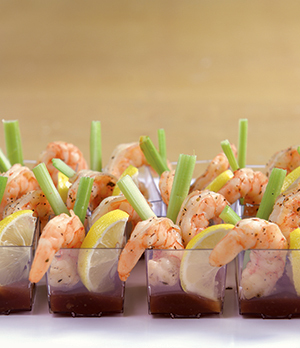 Shrimp shooters, prepared here by Two Rivers Hospitality Group, make for a tasty and attractive wedding-menu item. 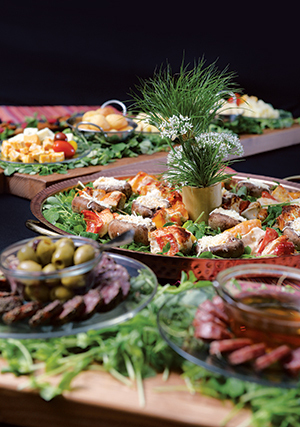 Rather than a buffet of salad + starch + entree, small-bite buffets are on the rise, notes Two Rivers Hospitality Group’s Alex Jimenez: “Couples want bright, colorful and beautifully decorated food.” The tapas can include almost anything, from sliders to yogurt parfaits to shrimp shooters. Emily Gross of Taste! To Go, has created DIY taco and mini hibachi bars this past year. “Our clients want simple food, but with a wow factor,” she says. Cuisine inspired by worldly flavors distinguish this spread created by Cyd Koehn. Why wait until the honeymoon to travel the globe? “We’ve had several couples request food stations with a different part of the world represented at each station,” says Cyd Koehn, owner and chef at Cyd’s Catering. Imagine one table piled high with sushi, while the next features a build-your-own quesadilla station. With gluten-free and vegan requests piling up, according to Gateway Market’s catering director, Kelly Crosby, these stations offer enough variety for guests to customize a meal that suits their needs. Along similar lines, Alex Jimenez of Two Rivers Hospitality Group reports that replicating site-specific dishes that speak to a couples’ history is another way local duos are trying the trend. 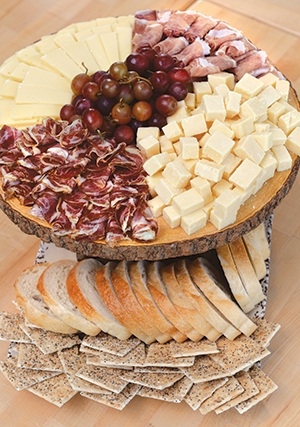 Gateway Market frequently gets requests for platters like the one they prepared here, featuring cheese and meats from local producers such as La Quercia and Frisian Farms. Many brides and grooms want a close-to-home vibe too, says Gateway Market’s catering director, Kelly Crosby, especially those who live elsewhere but travel back to the state for the ceremony. She lists Gateway’s apple-and-cranberry-stuffed pork loin as a representation of Iowa. 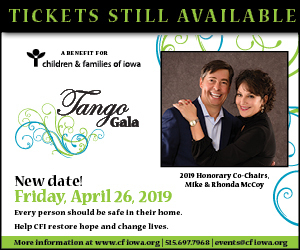 “The Iowa cheese and charcuterie platter is one of our most popular appetizers because the meats and cheese are made by local producers such as La Quercia, Milton Creamery and Frisian Farms,” Crosby says. It’s not just about eating local, but drinking local, too. “Craft beers can actually hold more weight than the food with many of our couples,” Crosby says. It’s cheaper to offer a selection of bottles from Exile, Confluence and Peace Tree Brewing, for example, than to host an open bar. 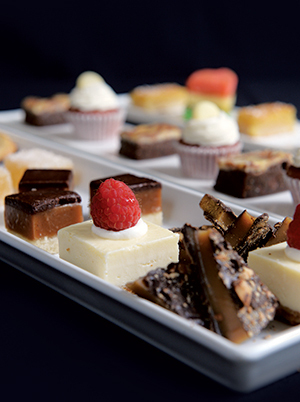 Tangerine’s dessert bar showcases a selection of petite goodies, including the couple’s favorite flavors and treats. This idea takes the cake … off the menu. “A lot of our clients choose an assortment of petite desserts, then add on a small cake for cutting,” says Cherry Madole, chef and co-owner of Tangerine. That way, they can still experience the ceremonial slice without having to serve everyone standard sheet cake. Madole asks about the couple’s favorite flavors and treats, from childhood to present, then designs the spread accordingly. Among the biggest hits: ice cream sandwiches, mini pies and a fancy s’mores bar. At Taste! To Go, owner Emily Gross has even constructed a Velcro wall covered in small-bite sweets. Female sommeliers face off in annual Iron Somm event.